the Beach as well as the River / Town. comfort. It can comfortably sleep 8 people. 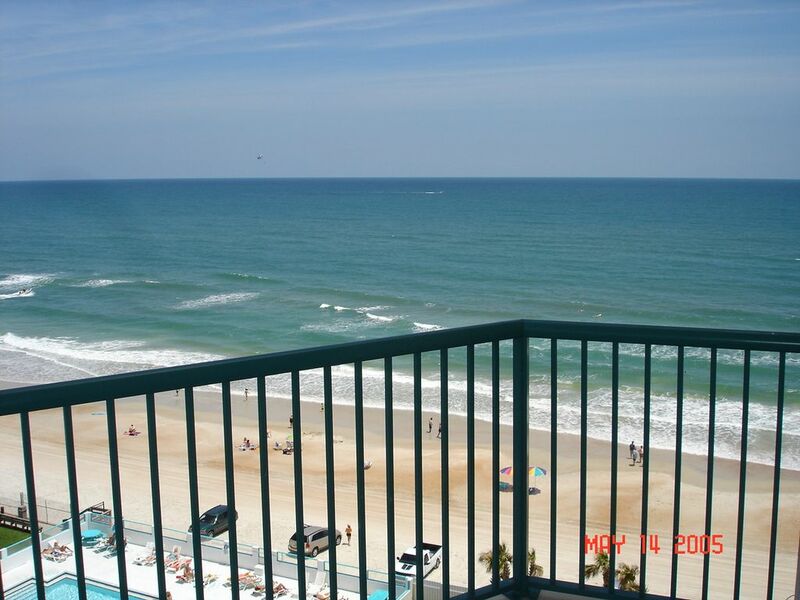 See the Ocean as soon as you step in the Condo !! Free High Speed Internet Access ! Second Bedroom is furnished with 3 Queen Beds !! Huge Balcony (183 accesible from the Family room as well as the Master Bed-room boasts a Spectacular view of the Beach/ Ocean as well as a view of the Daytona Skyline over the River. Dining Room has a formal Dining Table. Microwave, Oven, Cofeemaker, Tea kettle, dishes, flatware, etc. We live and work in winter Park, FL, about 50 miles away from Daytona Beach. We take care of women with Breast Disease / Cancer at our Central Florida Breast Center since 1996. We used this Condo as our Week-end get-away until we were able to buy an Ocean Front Penthouse in the same building !! Since this is such a beautiful condo, we decided not to sell it and decided to share it with you all. This Condo has a unique view. From the Balcony (which is accessible form the Great Room as well as the Master Bedroom) you can see the beach as well as the city. At night when the Beach / Ocean is dark, you can still enjoy the City view on the left side. Also, from the Front door, you can see the beautiful Congo river Golf Course across the street( miniature golf). This building has multiple security cameras all over the building. It is very safe. Step on the beach right from the Condo !! This Condo is locatedin such a way that you can enjoy Beautiful view of the Beach / Ocean from the Master Bedtoom as well as the Family/ Great Room. At night enjoy the City View also !! Across from Miniature Golf Course. Lovely colorful view from Front Door. This Condo is locatedin such a way that you can enjoy Beautiful view of the Beach / Ocean from the Master Bedtoom as well as the Family/ Great Room At night enjoy the City View also !! Washer and Dryer are located in the Unit itself. No need to go elsewhere!! Humongous Living / Family Room with view of the Beach / City. Access to the Balcony. Huge Balcony with access from the Family room as well as the Master Bedroom. Boat rentals available in near vicinity. Public Tennis Courts available in near vicinity. Free High Speed Internet Access available (you bring your Laptop/computer) Cable TV! TV in each Bedroom and in the Great room Central Air / Heat to put you in Paradise !! A Laundry room equipped with Full size washer / dryer to wash the sand away !! Also has a Ironing Board and Iron. Bask in the Two Heated outdoor Swimming Pools and two Jaccuzis overlooking the Ocean !! Enjoy the Luxurious Lounge downstairs.Free WI-FI, Play Pool Or hang-out and enjoy the view of the Twin Heated Pools and the Beach. Fully equipped State of the Art Gym with Tread Mills, Stationary Bicycles, Weight Pulley Machine, Free Weights !! Fabulous ocean view. Wonderful location. Great accommodations and very spacious and clean. Owner is super friendly and easy to work with. We love the time we are there. Thanks for staying at our Condo. We are very pleased that you enjoyed your stay. You all always leave the condo in a better condition than at your arrival !! We loved having you as our guest. You and your husband are wonderful people and we are pleased that our business relationship is now like a friendship. We look forward to see you again soon in November. Loved the vieuw from the 8th floor condo during the month of october 2017. This is a very comfortable,clean and well located condo with lots of room. We have rented quite a few condos in Florida over the last 40 years, this certainly is one of our favourites. The owner has been very helpfull on our arrival,showing us around. I am so happy to hear that you enjoyed our Condo and truly appreciate your kind words. We hope to see you again next year like most of our repeat clients. Thanks for allowing us to be a part of your vacation. We are glad that you enjoyed your stay. We look forward for your next visit. Our stay was wonderful! This is exactly what we were looking for, it was large enough to accommodate our family & had plenty of space for our friends and family to come and visit us during our stay! All of the residents were very friendly & welcoming! We will be returning! I am glad that you had a great time and the Condo met all your expectations. We look forward to having you stay with us again soon. Thank you for allowing us to offer our hospitality. We are very pleased with our stay ! The unit is very spacious, and met all our expectations .Fully furnished , and even has few updates compare to the pictures. The ocean view from two balconies is amazing ! The building is secure . The owner is very easy to work with and prompt when needed. Would recommend to anyone. Would like to stay here again! I am glad that you all enjoyed your stay. Hope you will stay with us again on your next visit to Daytona Beach. Very Spacious with beautiful view on the ocean. This is our third time renting from this owner. He is very friendly and easy to work with. Unit is very spacious. It has two large bedrooms and bathrooms. Nice kitchen area. Also like that it has your own laundry room. The living room and bedroom have a balcony over looking the ocean. Condo is clean. Has Congo River Mini Gulf across the street. Grocery store within walking distance. Close to restaurants. Building is secure . Has 2 pools and hot tubes. Hope to see you again in December.